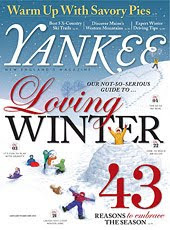 Yankee Magazine named the Rosewood Country Inn of the very best reasons to stick around New England for the winter. They said "there's no better time to find a romantic inn. We all know this truth: If you're with a person you love and you're loved in return, anyplace that's warm and clean can create a romantic getaway. But there are a number of special places that define "romantic". A big "thank you" to Yankee Magazine!